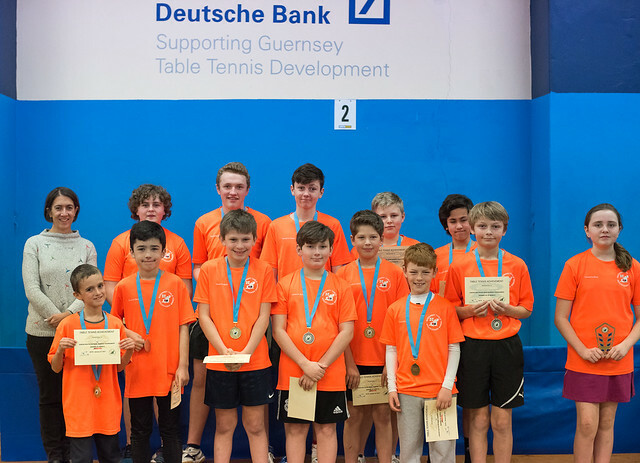 Another good weekend of table tennis at the Guernsey Table Tennis Centre saw 45 juniors take part in the fourth and final Deutsche Bank junior banded tournament of the season. In Band 1, Ben Foss took the title with a three-way tie for the runner up spot between Matthew Casey, Billy Ogier and Ellis Tomlin. Casey took second place having had better games difference. In Band 2, Corey Brouard came out on top winning all 7 games with second place decided by count back between Guernsey’s Callum Gilson and Alderney’s Thomas Cosheril. With Gilson beating Cosheril in round 5 by a 2-0 scoreline he took the runner up position. Band 3 saw fast improving Sammy Tostevin come out on top winning all his matches, while second place went to Erin Vaudin. Band 5 was also decided on count back between Evan Lesbirel and Alderney’s Courteney Benfield. Both players finished on 7 wins however Evan got the better of Courteney having beaten her 2-0 the narrowest of margins 12-10, 11-9. Band 6 saw another Alderney player take the title. Sian Craig took top spot despite losing narrowly to Harvey Le Tissier who finished in third position. Runner up went to Bradley Le Noury. 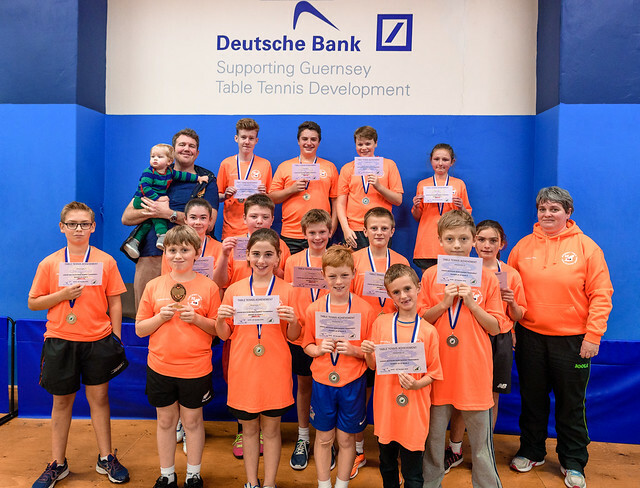 The second table tennis Junior Deutsche Bank Banded tournament was played at the weekend with 52 different juniors taking part over 6 bands with players placed in groups of their ability. In Band one the title went to Daniel Collenette who went 3 places better than the October tournament Runner up spot was on count back between Ben Foss and Ellis Tomlin both players finished on 6 wins and 2 loses with Foss getting the better of Tomlin by the narrowest of scores 11 – 6 , 26 – 24, to take second spot. In Band 2 we saw many young players playing some great tactical table tennis. Corey Brouard finished in first place winning all 7 games second place was decided on count back between 2 players Caden Brouard and Ben Sharp, Brouard beat Sharp 2 -1 to make it a Brouard one two. Band 3 saw improving Jonah Ingrouille come out on top for the second consecutive Deutsche bank, second place went to Sammy Tostevin however yet again for the third time the tournament organisers had a count back between Tostevin and 8 year old Zaheer Anees, Sammy had to come back from 1 – 0 down to win 11 – 8 in the third and final set. Band 4 saw the emergence of another new star 11 year old Henri Whitehorne. Winning all his matches and taking the title with runner up spot going to 10 year old Shelby Timms. The title in Band Five saw another family take the winner and Runner up spot Brothers Jamie and Callum Corcoran taking the honours. This was Jamie’s first tournament and he showed great determination only dropping one set to his elder brother Callum. Banded 6 was the battle of the beginners with Alderney’s Courteney Benfield taking top place and runner up spot went to Pierce Gorman, Pierce finished on joint points with two other players, Harvey Le Tissier and Bradley Le Noury with all players winning 4 matches each, Pierce just narrowly piping them to second place by a better sets margin. Player of the day for good sportsmanship on and off the table went to Alderneys Amy Wesley. 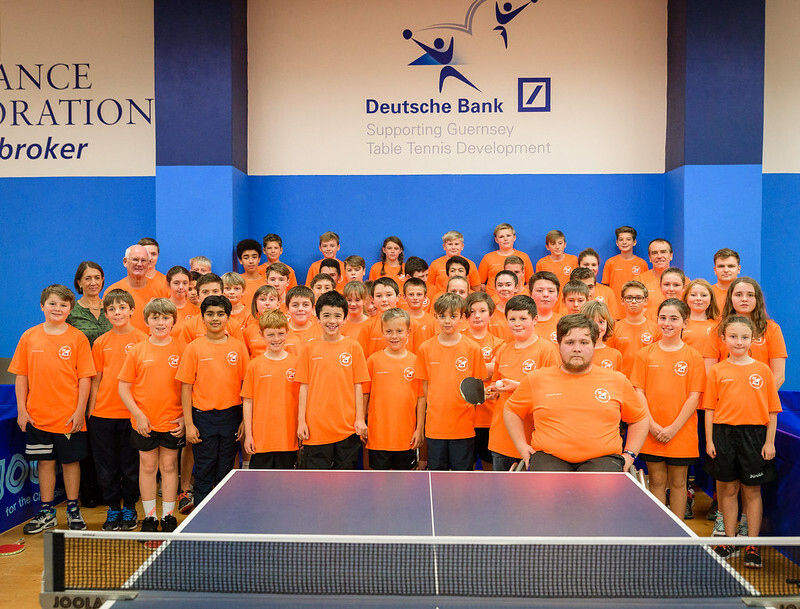 The table tennis Junior Deutsche Bank Banded tournaments got off to a start at the weekend. 55 different juniors took part in the first of four Junior Deutsche Bank tournament of the season with 7 bands of 8 players in their new Electric orange sponsored shirts. And it turned out to be an all bright day at the table tennis centre. In Band one the title went to Ben Foss and Runner up spot was on count back between Matthew Casey and Ryan Bichard both players finished on 5 wins and 2 loses with Bichard getting the better of Casey 2 – 1 11 – 4, 8 – 11, 11 – 6 to take second spot. In Band 2 we saw many young players playing to their best all beating each other. Ben Sharp finished in first place despite losing narrowly to fourth place Callum Gilson then second place was decided on count back between 3 players Alderneys Amy Wesley, Thomas Cosheril and Guernsey’s Callum Gilson. All 3 players had won 5 games. The runner place went to Amy Wesley having a better games difference having beaten both Callum and Thomas 2 – 1. Band 3 saw improving Jonah Ingrouille come out on top dropping only one set to Sammy Tostevin, second place went to Jack Le Prevost. The title in Band four went to Alderney’s 11 year old Star O’Connor who took the title over Robert Naftel in second place Henri Whitehorne took the top place in Band 5 with 10-year-old Jayden Tucknott coming a close second. Band 6 saw the emergence of another new star 11 year old Emilie Walker. Winning all her matches and taking the title and runner up spot went to Joshua Chalmers. Banded 7 so the battle of the beginners with, Alderney’s Courteny Benfield taking top with 8 year old Liam De La Mare coming runner up. Player of the day for good sportsmanship on and off the table went to Pierce Gorman. The tournament had some exceptional matches on show on all 14 tables during the course of the day and many of the 7 bands matches going to the wire. Next Junior Banded tournament takes place on Saturday 26th November 2016.